I truly do love this show. 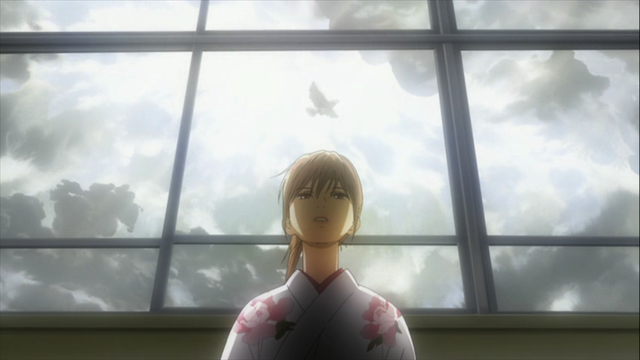 Chihayafuru episode 10 had so many things going on, from the tension around the central love triangle, to personal triumphs and sorrows, all within the larger context of the Tokyo Regional tournament preliminaries. The pacing is excellent. There always seems to be an excellent mixture of pathos and comedy. And to top it all off, the show continues to look great, especially because of Kanade’s condition that everyone must wear hakama in tournaments. Since it is a tournament, the team abides by Chihaya's agreement with Kanade (although not without some grousing). 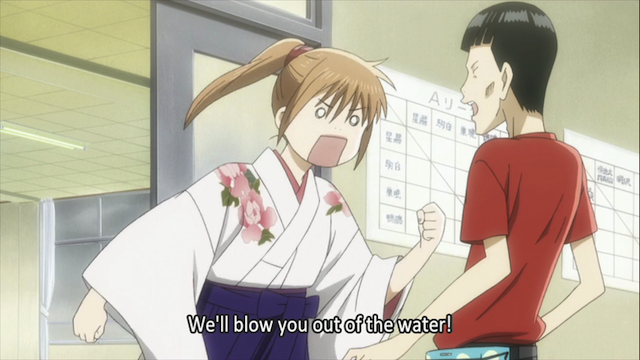 Tsutomu (left) and Chihaya (right). More hakama goodness. 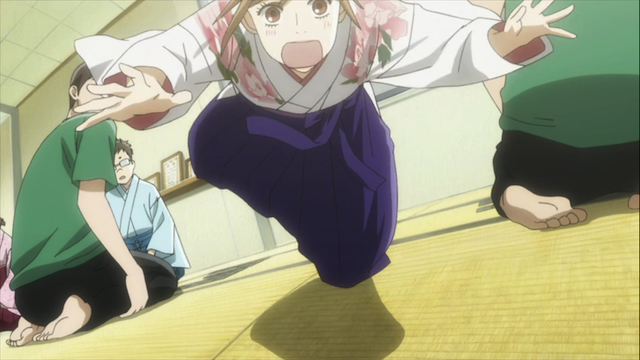 Chihaya stands out in the crowd, although Kanade would never approve of running in a hakama. The Tokyo Regional for the national high school championship has begun, and it serves as an excellent vehicle, both for comedy and for drama. Somehow this episode managed to work in interesting mini-stories about four of the five team members, with Nishida mostly playing support. I do think he made one possibly insightful comment, however, that I’ll return to below. Taichi can't shake the ghost of Arata Wataya. Taichi Mashima. All true love is unrequited. This was such a great episode that a lot could be said. 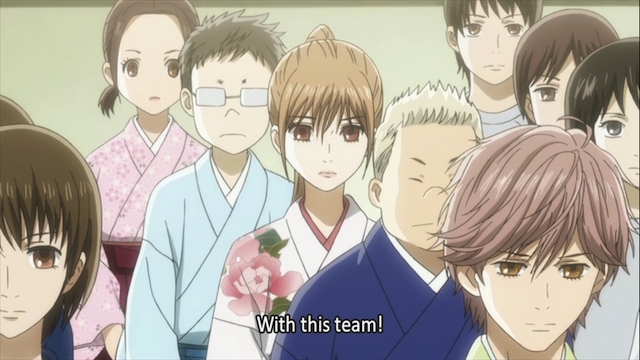 For example there were several times that Taichi attempted to step in and truly be a leader for his team. To me the most impressive one, however, is the way he defused things just after taking the emotional gut punch we can see in the preceding screen cap. Taichi handles the crisis that Tsutomu created, but he goes on to stop unnecessary criticism of Tsutomu, and to point out a deeper structural flaw in the Karuta club. That he handled the problem so effectively, when the easiest thing would have been to channel the pain he was feeling into rage, shows that Taichi is truly an extraordinary person. Tsutomu Komano and his crisis of faith. 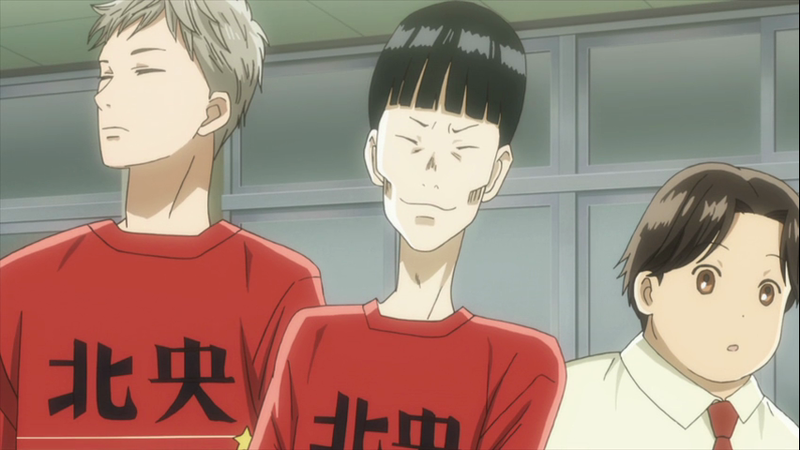 Tsutomu allows his own feelings of frustration and embarrassment to cause even greater difficulties for the whole team. I like the screen cap above. 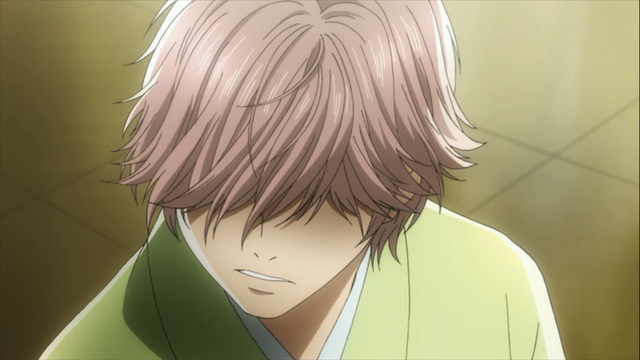 His outburst has put him back where he was before he joined the Karuta club. He sits alone at a desk. In some ways this is his episode. His problem was very believable. It is only reasonable to expect that he would lose repeatedly, and anyone would feel frustrated in such a situation. 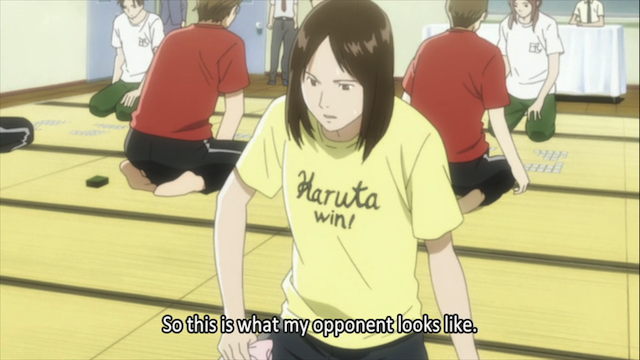 Of course Tsutomu is hung up on winning more than anyone, as we saw in the episode in which he was introduced (well, anyone outside of Taichi’s mom). Kanade Oe. 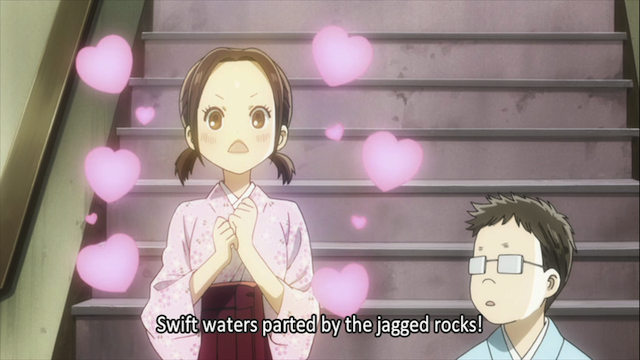 Hey, it wouldn't be Chihayafuru without emotions running wild, would it? I also REALLY liked the way things were resolved in the end. First Tsutomu comes to a realization that he cares what happens to his new friends. Then Kanade leads him to another realization. The other players at the tournament have calluses on their feet from the many hours they have put in over years kneeling on the tatami mats. This was actually the second great moment in this episode for showing that Kana-chan can be a thoughtful, strong individual. But her words about the effort that everyone had put in, must have made a lot of sense to Tsutomu. In the end he accepts his losses, and is reunited with the club. He also acknowledges Kanade’s win as legitimate, something he had refused to do before. 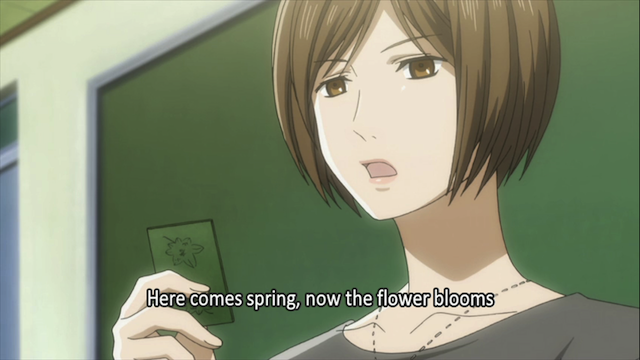 Hokuo High School - a Karuta powerhouse. We also get to meet a couple of members of the team that is favored to win the match, and they look pretty interesting. 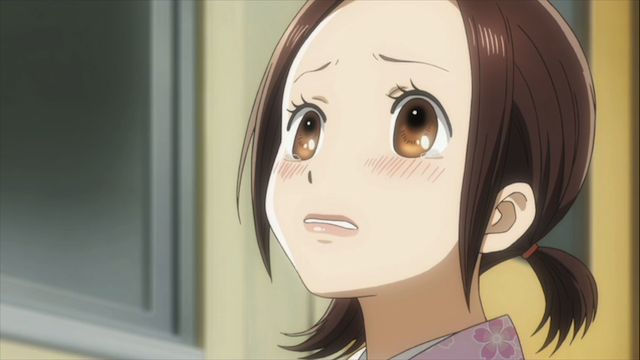 What does Chihaya have to say about the team that went to the national championship five years in a row? But Mizusawa High (Chihaya’s team) won’t get to face Hokuo for a match unless it wins the semi-final first, and Tsutomu has his breakdown just before the last match of the semi-final. Taichi refuses to let him leave the tournament, but lets him sit out this match. By forfeiting Tsutomu’s hand, Mizusawa High is behind one before the opening poem is even read! To make matters worse, Chihaya’s playing is off. 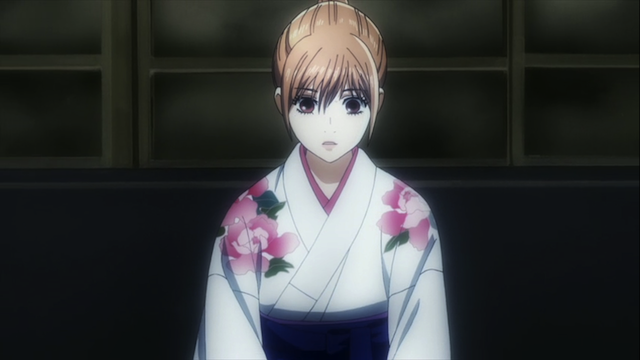 Chihaya Ayase. Her playing strength comes from her extraordinary hearing. We can see that her hearing is impaired, because everything around her is dimmed. This one little section was quite interesting. Chihaya is struggling both against the distraction of her emotional anxiety because of the fight the team just had, and also because their opponents are very loud. With her opponents so loud, she has a difficult time putting her hearing ability to good use. But the opposing side also represents the kind of united team that Mizusawa High does not have. As Taichi diagnosed it, they aren’t a team yet, they are playing as individuals. 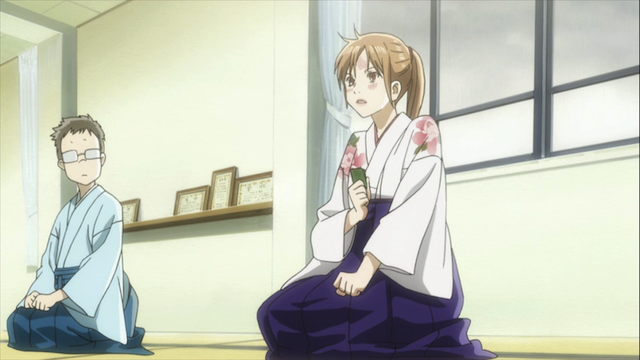 Fortunately Taichi is a good leader, and he manages to get Chihaya to calm down a bit by reminding her to breathe. As soon as she starts breathing properly, the clouds (literally) part, and she can hear a distant bird flapping its wings. 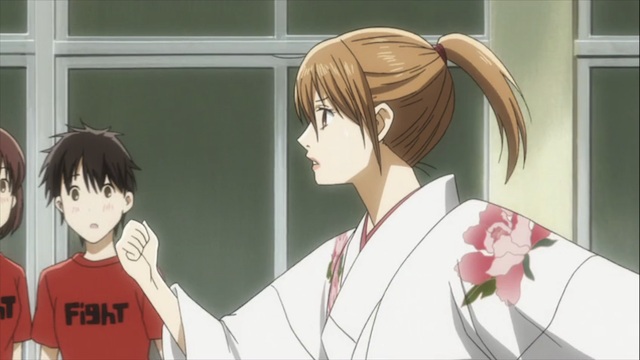 And, for the first time, Chihaya sees her opponent. This section was put together in such an interesting way. It really held my attention throughout. It had everything you could want in a sports anime, from the pre-game drama that puts them at a disadvantage, to an opposing team that had unwittingly found a way to neutralize the best player, to moments where the team pulled together, and, of course a come from behind victory. Bonus pic: the reciter sings the opening poem, and prepares to read the first card. Yes…delightful, delightful, delightful. I don’t know what the chances are of this show being brought out on DVD domestically (slight, I would guess) but I already know I’ll buy it in a hearbeat if it is. I’m really enjoying Taichi’s character arc. From jealous bully to conscientious and self-effacing team leader. Who’d a thunk it? 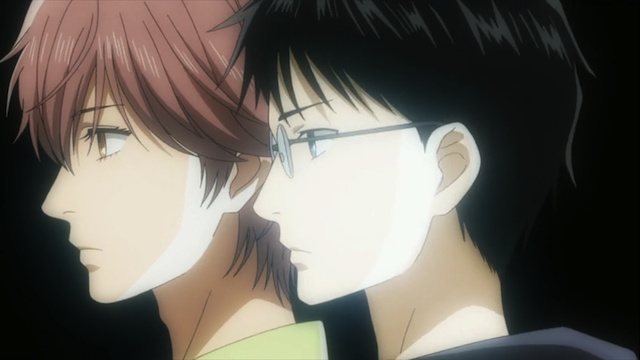 And I think Tsutomu’s analysis of the Chihaya/Arata relationship may end up being very close to the truth. But then again, this show is great at cutting hair-pin turns, so who knows where these characters might end up? She might end up delcairing to Pork Buns!! 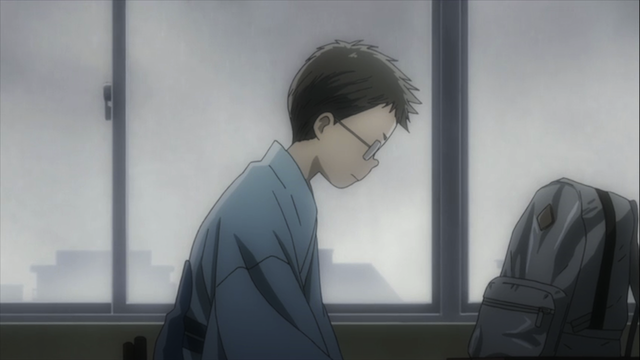 On a semi-serious note, did anyone notice a little bit of chemistry between Kanade and Tsutomu? Hmmmmm??? I sadly must agree with you that this has very little chance of getting a domestic release. Hell, they never released Nodame Cantabile, which probably is more accessible than a show about people who are “bonkers for Karuta”. But, yeah, I would buy this one if it came out with subs or dubbed. I would love to give something like this to my nieces. Have to agree on Taichi’s character development as well. That is pretty good writing, especially because it was handled believably. This was such an excellent episode! I would say it was one of the top of the season so far. So much going on, but it never seemed forced or too fast. I was also very interested in the Sadistic guy from the other team. And yeah, I saw some chemistry between the two beginners as well! Yeah! This episode was full. And I’m definitely looking forward to seeing what happens against the reigning regional champs. Taichi defo deserves more credit, and I’m glad to see he’s getting it from some of us, lol. I also really liked Kana-chan’s development in this episode; glad to see how observant and thoughtful she can be – defo not just a pretty face! Yeah, I called Taichi out for pushing people into the mud, and stealing other people’s glasses, but I don’t think he was a bad leader in this episode. He might not have been perfect, but, dear lord, who IS perfect? I give people props for trying. Taichi is trying to be a good leader. In the terms of the show, it isn’t about being a master, it is about seriously putting time in on the mat. About Kanade, she seems so much more confident and reliable when she is wearing traditional clothing. I like the way she was willing to give her teammates advice in this episode!